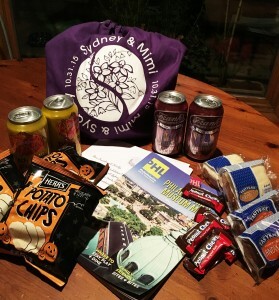 Welcome bags are not just for weddings and trade shows — make your guests feel at home for any important event. Whatever the occasion, be sure to provide an itinerary for your event including useful information on transportation and area tourist attractions. Local treats and souvenirs are always interesting and appreciated. Items specific to your celebration are especially delightful; heel protectors for grassy outdoor weddings, umbrellas for spring showers, foot pads and food cream are great ways to let business associates know you care at your next big trade show. Li Halpern Events can help you to create a special package for the people you care about.